I am super lucky in that my new apartment is just a few flights of stairs and across the street from public access to Donner Lake. I can go from lying on the couch to lying in a floatie in under 5 minutes! While Lake Tahoe gets most of the glory in the area, Donner Lake is an underrated gem! When I lived in South Lake Tahoe, I was only a couple of blocks from a public beach, and, comparing the two, I actually prefer swimming in Donner Lake. The Lake Tahoe beach I was closest to was really, really shallow – especially these last couple drought years. You would have to walk out a half mile to be deep enough to swim! It would also get really gross from the shallow water, popularity and nearby dog beach. Uggghhh – green slime. Slimy and shallow Reagan Beach on the south shore. Photo by Greyson Howard. Donner Lake, on the other hand, gets deep quite quickly, and I much prefer the nearshore water quality to the south shore of Lake Tahoe. Greyson Likes to say that Donner Lake would be way more popular if it wasn’t so close to Lake Tahoe. Honestly, though, I don’t really mind! It definitely still gets busy on nice weekends, and it can be especially crazy on holidays – Memorial Day, 4th of July and Labor Day. Check out the amazing photos he took of Donner Lake (from Green Phantom climbing area on Donner Summit) last week. Donner Lake is open to motorized traffic, but you’ll see tons of stand up paddle boarders, kayakers, small sailboats and swimmers in the water. There are a bunch of places around town you can rent SUP and kayaks, and a couple of places on the lake to rent boats as well. The coolest thing about Donner Lake are its public docks. These are small docks owned and operated by the Truckee Parks and Recreation district, and are available to the public on a first come, first serve basis. These docks aren’t big enough to launch a speedboat or anything, but they are perfect for hanging out in the sun and wading in to cool off. Most years, you could launch a canoe, kayak or stand up paddle board from the docks, but the water is a little low for that for Summer 2015. The plus side to the low water level is the small sandy beaches that have appeared making for even more public water access. We watched the fireworks on the Fourth of July from one of the new beaches on Saturday. For my friend’s bachelorette party last summer, we claimed a dock early in the morning, and hung out there all day, drinking beers and floating on inner-tubes when we got too warm. It was a great way to spend the day before going out that evening. For your best shot at claiming a dock, arrive by at least 9 am on weekends, though you may get lucky later in the day. You can park for free on the side of Donner Pass Road, but don’t park in the bike lane! You’ll get ticketed, and it’s rude to the many cyclists who ride that way for transportation or recreation. The docks are located on Donner Pass Road on the north side of Donner Lake. If you run out of food, drinks, or sunscreen, you can find that and more at Sticks Market, which is the best store in the area. If the docks are full, or you’re more interested in a sandy beach, you can head down to West End Beach, which is open to the public for a $5 admission fee before 5:00 pm. West End Beach has a number of amenities, including a playground, bathrooms, concession stand and rentals. I like to head to West End Beach to watch the sunset. You won’t have to pay the entry fee, and the water is usually still warm enough to swim in the early evenings. Occasionally, local gear shops host free stand up paddle board demo days and races, so check that out! Donner Lake is also the home of Donner Memorial State Park (yes Donner Lake is named after THOSE Donners), which has camping, a public boat ramp, a visitor’s center and a monument to the Donner Party. Another thing I like to do at Donner Lake is ride my bike around it. It’s pretty easy 7 mile road bike ride, that takes you through the state park with only about 170 feet of climbing (ignore the elevation on my Strava Map picture – I’m not sure what’s going on there!). Though it has felt like summer in Tahoe since about mid-February, official summer is almost here! Summer is the best time of year to be in Tahoe, but it always feels like summer slips away before I know it. So for this summer, I’ve created my official Tahoe Summer Bucket List! My list consists of new experiences and things I’ve done before, activities close to home and a few that are a short road trip away. Backpack in Desolation Wilderness. I’ve lived in Tahoe for almost five years now, and I still haven’t gone backpacking in this gorgeous area in my backyard. Jump in Webber Falls. I went a couple of times last summer, and I’m excited to go back. Boulder in Tuolumne Meadows.While the Yosemite Valley is popular for good reasons, the less crowded, east side of Yosemite National Park is an underrated gem. We have plans to do some bouldering, and then jump in the Tuolumne River. Soak in culture with Shakespeare at the Lake.The state park at Sand Harbor near Incline Village, Nevada has one of the best theatre venues in the world. All summer long, you can watch a Shakespeare play while the sun sets over Lake Tahoe at the Lake Tahoe Shakespeare Festival. This year, the show is Romeo and Juliet. Go Gnarbuckling in the Yuba River. The South Yuba River near Nevada City is a pretty magical place. The area’s mining legacy created boulder fields, deep pools and mini waterfalls. One of Greyson’s friends invented the sport of “gnarbuckling”, which is traveling upstream in the Yuba River, via hiking, scrambling, swimming, jumping and falling. It’s quite a workout, and is best chased by a Mammoth 395 at Matteo’safterwards. Do my first bikepacking trip.Neither Greyson or I have done bikepacking before, but we have big plans do a one or two day bikepacking trip on the Tahoe Rim Trail, or some other local spot. Visit all the local breweries!Tahoe is finally stepping up its local beer game, and I have yet to sample all of the new options. That’s going to change this summer. I haven’t tried Alibi Ale Works in Incline Village or The Brewing Lair in Blairsden. I need to give Tahoe Mountain Brewing Co. in Tahoe City another shot and return to Cold Water Brewery in South Lake Tahoe. I’ll hopefully go on some road trips, and visit my favorites, Mountain Rambler Brewery in Bishop, June Lake Brewing in June Lake and Mammoth Brewing Company in Mammoth Lakes. New and new-to-me breweries seem to be popping up all over the place, and I plan to visit as many as I can! Also, I hope to hit up one or two beer festivals. Maybe Truckee Brew Fest or Reno’s CANFEST. Raft the American River. Just down the hill from Tahoe, the American River runs through Coloma. This spot is a world class white water rafting destination, and I’d love to do a raft trip this summer. Climb a 14-er. Probably not Mount Whitney, but I’d like to climb one of California’s 14,000+ foot mountains this summer. Bike at Mammoth Mountain Bike Park. Last year was the first year in a long time that I didn’t spend at least a day biking at Mammoth Mountain. Even with lift serviced trails, you’re working hard on the fun trails with great views. Hike from Sugar Bowl to Squaw Valley on the Pacific Crest Trail.Hopefully the wildflowers will be in full bloom when I do this hike. Swim every week! We may be in the midst of a drought, but Donner Lake and Lake Tahoe still have excellent swimming. Once it warms up, my goal is to swim at leastonce a week, and spend a lot of time on our pristine beaches. These are just a few of the things I hope to do in Tahoe this summer. Anything epic I’m missing? Or, if you are visiting the Tahoe/Truckee area and want some suggestions, feel free to get in touch! So, I don’t want to brag…but I found the best state park in California. I considered not sharing and keeping the pristine, remote wilderness to myself. But Sinkyone Wilderness State Park is so far off the beaten path that I don’t think I need to worry about it getting overrun. Sinkyone Wilderness State Park is one of the few ways to access the Lost Coast – California’s least developed stretch of shoreline. We undertook quite a journey to arrive at Sinkyone (spoiler alert: worth it!). First we headed east and south from Graberville, California, taking twisty backroads through the trees, passing high fences, large fertilizer tanks, and the overwhelming smell of marijuana. We made a mental note not to wander off trail in this area of northern California. After 20 or so miles of this, we followed signs to Sinkyone Wilderness State Park, Needle Rock Visitors Center, and camping and onto the steepest, windiest, narrowest dirt road I’ve ever been on. It was pretty foggy, so we couldn’t really see where we were headed, and I’m pretty sure Greyson thought that I was taking him somewhere remote to abandon him. After three miles of dirt road (which seriously took like 40 minutes to descend), we got our first incredible glimpse of the Lost Coast. Can you spot the Harbor Seals? 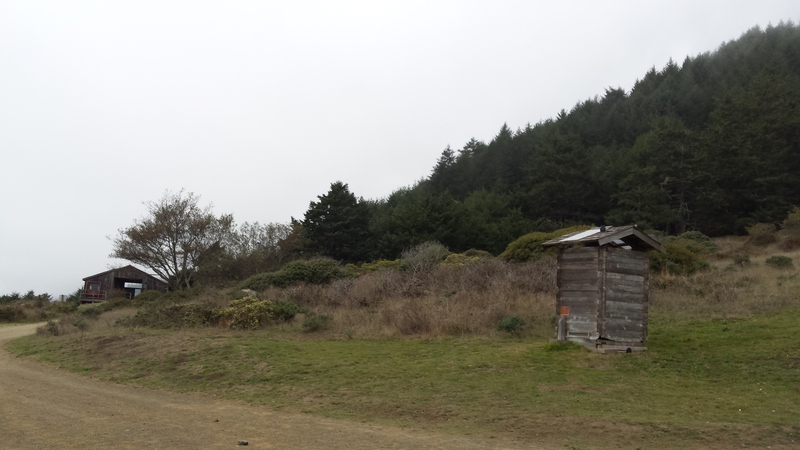 We checked in with the camp host, and set up our tent on a bluff overlooking the ocean. (You can also book a spot in an old barn if you want!) There are only a couple of spots available at Needle Rock Visitor Center, so you are guaranteed to not feel crowded! While we were car camping, there are hike in camp sites within a mile or so of the parking area. We decided to head down the steep trail to the beach before dinner. The camp host had warned us about the steepness, and he was not kidding! There were several sections where a rope tied around and nearby bush were necessary to descend and later ascend. Like the drive, the hike to the beach was worth it. It was sheer cliffs and black sand beaches as far as we could see, and our only company were the dozens of curious harbor seals basking on the rocks. Needle Rock beach has got to be one of the best beaches in all of California. Over the few days we spent at Sinkyone, we spent quite a bit of time at the beach – examining tide pools, getting into staring competition with the seals, watching pelicans dive, and attempting to climb on the rocks. We even saw an otter, which are supposed to be extinct that far north on the California coast! We also hiked a section of the Lost Coast trail to look at some neat geologic features. We hiked up a steep hill, hoping for a great view. While we didn’t exactly get a view of the ocean, hiking to above the fog was pretty awesome! We also saw the local elk herd. If you plan on visiting Sinkyone, be sure to check the weather, as the road probably becomes impassable in the winter/rain. Bring everything you need with you, as there’s nothing in the way of supplies available. Pack out your garbage, as there is not garbage pick up in the park. Be sure to bring rain gear, hiking shoes, and binoculars!